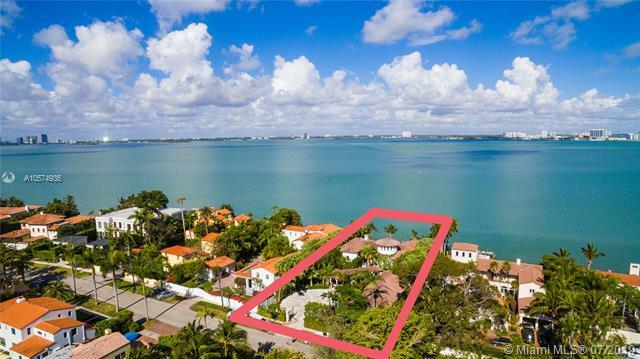 EXPANSIVE WIDE OPEN BAY & MIAMI SKYLINE VIEWS FROM THIS NORTH BAY ROAD ITALIAN VILLA COINED BAY ROCK IN THE 1930s! This impressive Walled & Gated Estate sits on just under Half Acre and was gut renovated into clean Modern Spaces with Old World Architectural accents throughout the Villa. Light finishes throughout at Top of the Line finishes such as Waterworks plumbing fixtures, restored Light Oakwood & Travertine Floors, Marble & Mosaic tiled Baths and Impact Windows & Doors. Open Floorplan with Fireplace leads to Chefs Kitchen with Eat-in Island and large Waterfront Dining Room perfect for Entertaining. Upstairs features 2 Master Suites + 2 Guest Suites, Walk-in Closets & Marble Bath enjoying Bay Views and Private Terraces. Large Pool overlooking the Dock + 3 Car Garage. BAKARA SESTO SENSO~ULTRA-MODERN BAYFRONT RESORT-STYLE AWARD WINNING MASTERPIECE WITH SUNSETS OVER THE MIAMI SKYLINE ON PRESTIGIOUS NORTH BAY ROAD IN MIAMI BEACH! A rare find...Newly Built under OLD Code allows for rarely found Rooftop Pool on 3,500SF w Entertaining Lounge & Elevator access to all levels. WHITE on WHITE seamless Architectural Marvel by Zeb Jarosz, Jennifer Post & Raymond Jungles. 8 Beds + 9.5 Baths in 14,422 Adj Gross SF on 21,517SF LOT w 106FT of Waterfront. Luxurious Italian Custom Kitchen in White Glass w Gaggenau & Miele Appliances. Statuaria Marble Bathrooms, Oversized Closets, 12FT Telescopic Doors. Fitness Center & Spa w Steam Room, Movie Theater, Massage/Yoga Deck & Dining Room w Wine Storage. Exit thru Courtyard wrapped by Water Features. 6 Car Garage + NEW Dock.